These Dice Cage Sets come fully equipped for use. Each set features a stainless steel cage, felt lay-down, and dice. 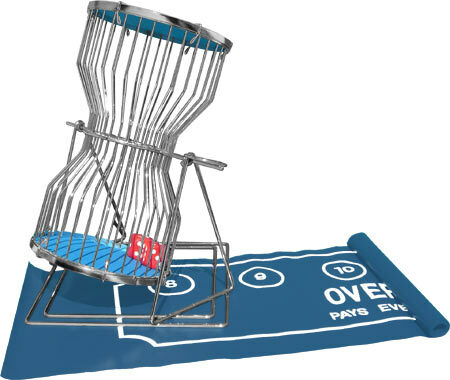 (The Over-Under Cage Set comes with 2 dice and the Chuck Cage comes with 3 dice - Naugahyde layouts are also available for both games.). Made of precision-crafted stainless steel wire, our cages are among the most durable available. Each cage is lined on the top and bottom with casino green felt. The jumbo / oversized dice make for easy viewing. 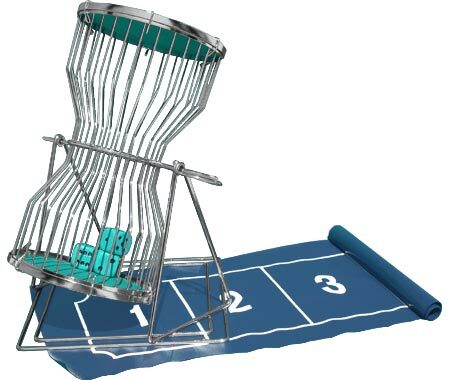 10" and 18" Dice Cages are available. 10" Cage Sale Price: $35.75. Was $60.00. Save 40%!